In the midst of all the snow in Iceland right now might be appropriate to mention the Snowrollers, a rather odd weather phenomena. Occasionally after storm follows heavy snow, it seems like the wind has rolled up the snow as if its been rolling up a carpet. Farmers get to see this mostly if they venture onto their fields after a stormy night in a snowy winter season. Sometimes there are hundreds of them in one field. It’s not a common occurrence but also not that rare, they have for example been spotted outside the window of the Icelandic Meteorological Office, who also happens to be quoted in this article. There is no known proper name for the phenomena in Icelandic, they have been called Skotta but many things are called Skotta in Iceland, including female ghosts, in this case it might be because the seem to leave a tail behind them, Skotta means tail. However in English they are simply called Snowrollers. The same source tells that the largest Snowrollers mentioned in their archives are the ones observed by Geologist Guðmundur Kjartansson. He depicts them in an article in the Weather journal (Veður) from 1957. He saw them in February 1956 and carefully describes the weather conditions that preceded them and helped create them, and moreover how some of them were no larger than a human head and some up to a meter in diameter, the larger ones being extremely rare. In January 2013 there were quite a bit of Snowrollers captured on camera and they can be seen here. In general a must see website for safety reasons when traveling in Iceland, especially in winter. 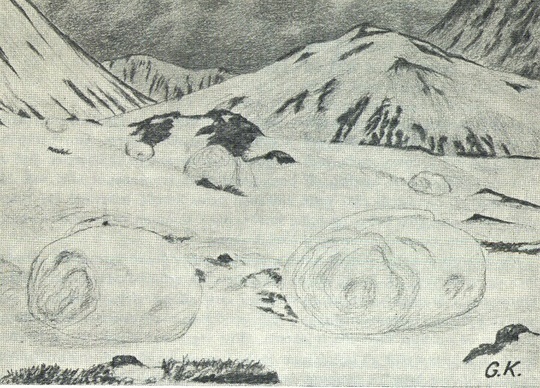 The image shows Gudmundur Kjartansson´s drawing of wind made Snowrollers. It was published in the Weather journal (Veður), p. 13. II volume, I part in 1957 and is borrowed from the Icelandic Meteorological Office website.